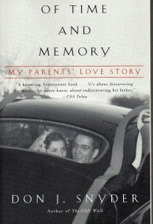 Don Snyder on Love and Loss: "Of Time and Memory: My Parents' Love Story"
My guest today is Don J. Snyder, author of Of Time and Memory: My Parents' Love Story [Random House, 2001]. Welcome to OpEdNews, Don. Joan Brunwasser: Of Time and Memory is about love but also about secrets, big ones. What compelled you to write this story? Don Snyder: It was the winter of 1998 and my father was diagnosed with a brain tumor. I began to think he would leave this world without me ever knowing who he was really. I mean, the man he was beyond my father. From the time I was a little boy, I felt drawn to understand why he was always gazing off into space, why he seemed to belong to some other world far outside my world. He was just a mystery to me all my life. Then he got sick. I was 48 years old, perhaps feeling that I was nearing the end of my own youth. Time. Time seemed to be running out for us. I mean the time we'd shared, the time when we might have gotten to know each other was almost lost and gone. That seemed profoundly sad to me. I wanted to do something about it. You know, who our parents were before we knew them, and the love story that carried us into the world remains a mystery to most of us. Who were those people in the old black and white photographs? JB: You discovered all kinds of things in your quest to draw closer to your father. Can you start us off, please? DS: Yes, of course it took some time but it came down to my father telling me that my mother, the only mother I had ever known, was not my real mother. My real mother was a girl he had been married to for nine months in 1950. And she died sixteen days after giving birth to me and my twin brother. Her name was Peggy. He was her first love and she was his. She was nineteen years old. We went together to her grave for the first time. Then I set out to learn their love story and to write a book about the time they had shared. I spent months tracking down everyone who had ever known her and him when they were young. All the people I spoke with told me they had been told that she died because her heart was not strong enough to bear twins. My father told me the same thing. So that was what I wrote in my book, Of Time and Memory which was published by Alfred A. Knopf in 1999. Soon after the book was published, I was on the Today Show talking about all that I had learned and written in the book. When I went back to my hotel room there was a call from home that a doctor had called me. This was Peggy's doctor. All he said to me was, "I read your book. You got it wrong." JB: I'm sure that shook you up! So what did you do about it? DS: I called the doctor and he refused to talk with me. He was very angry about the book. I called him once a week for several months and then I turned away. I had four little children to raise and to provide for. I wrote three more books and a movie. I just buried myself in that work. Of course, I was haunted by the thought that I had failed to write the whole truth in Of Time and Memory. My clothes never seemed to fit me again. I fell into a deep depression that lasted for years. I did my work on these other books and on the movie, but my heart wasn't in that work really. I kept asking my father why Peggy's doctor would have told me that my book was wrong. My father didn't know. He didn't know anything. View All 35 Articles in "authors"